Will the species be suitably durable? Is the profile appropriate for the direction of the boarding? Are the battens pressure-treated and strength-graded? Have you allowed the right cavity size? Do you need a breather membrane? Are you using the right fixings? If you’re using softwood, whether spruce (whitewood) or pine (redwood) you need good quality, slow growth timber, typically from Sweden and other Nordic countries. Its moisture content should be between 16% and 19%. Both pine and spruce need to be preservative pressure-treated to Use Class 3, even if you are going to paint them. Make sure the surface of the wood is thoroughly dry after treatment, otherwise any decorative coating won’t adhere well. Other softwoods, such as Siberian larch, Douglas fir and Western red cedar may be used untreated, but you will need to specify heartwood timber (the sapwood excluded). Many hardwoods, such as sweet chestnut, red louro and yellow balau can also be used untreated, as can modified timbers like Accoya™. In the latest version of EN350, European oak has been re-classified as Durability Class 2-4; to ensure oak is suitable for cladding, verify it meets Durability Class 2-3. 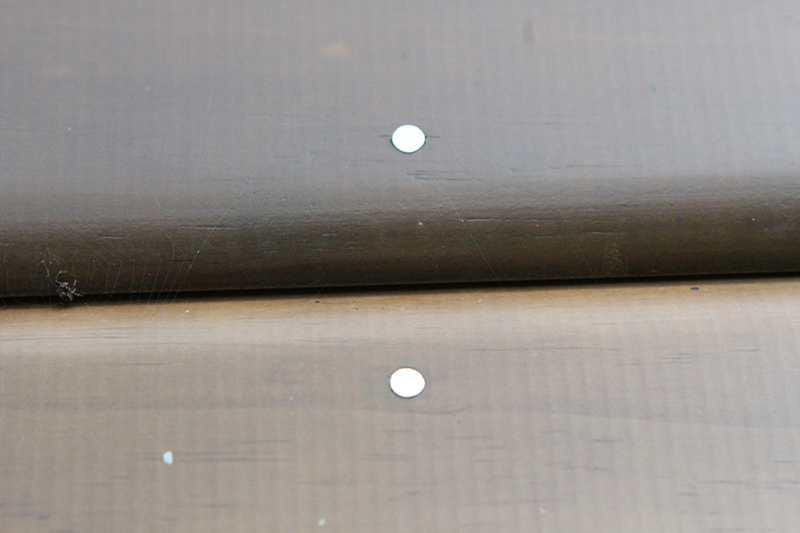 Some modified timbers and high tannin species, such as oak require special stainless steel fixings. Getting the detailing and fixing right are as important to the life of the cladding as choice of species. BS 8605:2015 is the standard covering external timber cladding. Refer to Wood Campus specification sheets for design and fixing details for different applications. Wood’s moisture content will change relative to its surroundings. 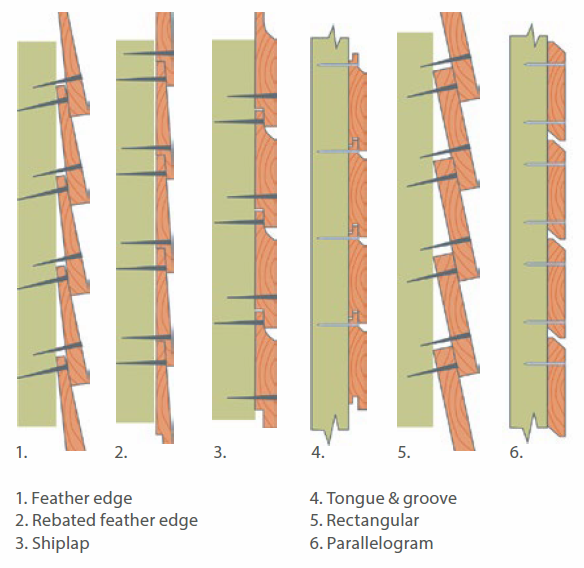 Different species have different degrees of movement and this must be accounted for in timber cladding design. Timber cladding should have a moisture content of 16% ± 3% at the time of installation. Wood expands across the grain, rarely along it. Oak, pine and spruce will change 1% in dimension for every 4% change in moisture. There is a wide choice of standard profiles available in softwoods, modified woods and hardwoods typically up to 150mm in width. Are you laying the boards horizontally, vertically or diagonally? Check which profiles are suitable. Styles can vary from one manufacturer to another, so always obtain samples and agree quality parameters before ordering. If you need a bespoke profile or specific species, contact a member of the TDCA. Only specify cladding manufactured under a recognised quality scheme such as the TDCA CladMark/ISO09001. Thickness is largely determined by the profile required. Guidance is available in British Standard BS8605: External Timber Cladding Part 1: Method of specifying. Avoid sharp edges on cladding. 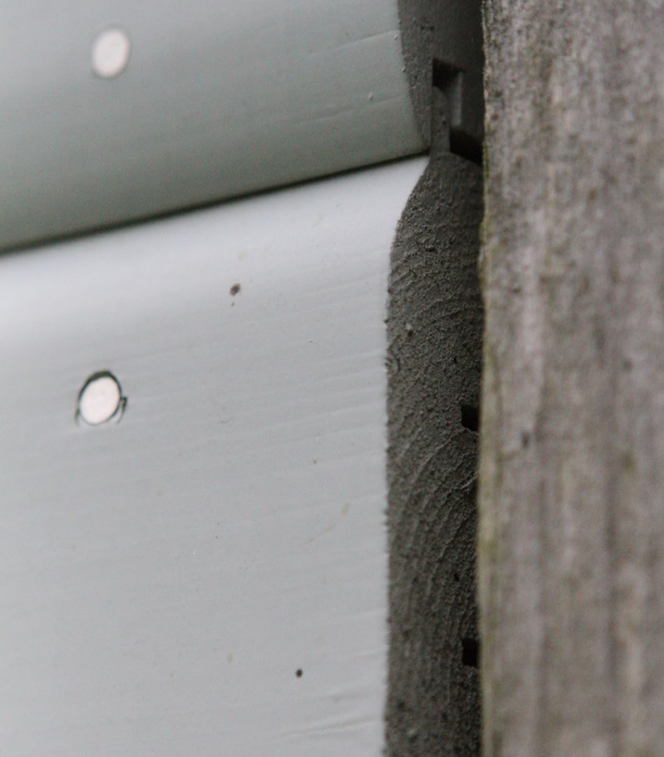 A minimum radius of 3mm on the bottom of horizontal cladding will help shed water and prevent it tracking up the back of the cladding. 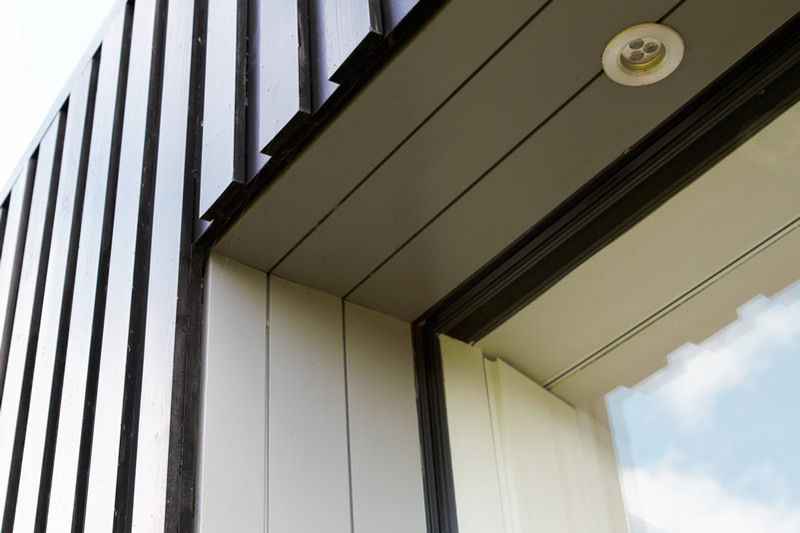 Timber Cladding can be applied in any one of three directions, which will have an impact on the methods of fixing as well as on the overall look of the façade. Available with overlapped or profiled sections. Shiplap or feather edge boards should have a minimum 15mm overlap, and 2mm gaps between the up-stands. Tongue and groove boards should have a maximum face width of 125mm, with a 2mm clearance above the tongue for expansion. Install with the tongue upwards. 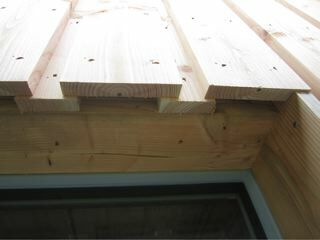 Open joint boards should have an 8-15mm gap at the ‘water face’. Chamfered edges allow the boards to overlap slightly, reducing any exposure of the cavity. Board-on-board, shiplap and tongue and groove profiles are used. Tongues need to be long enough to allow for slight movement of the timber so that open gaps do not develop with atural movement. The face width of tongue and groove vertical boards should not exceed 125mm. The most versatile fixing method is board-on-board. Any overlap should be a minimum of 20mm. Overlapping boards are not suitable. Shiplap boards are advisable and should be fixed to battens. Use counter-battens to provide ventilation. Use softwood battens that are preservative treated for a BSEN335:1 use Class 3 application and structurally graded to ensure they are able to carry the weight of the board material. Fix horizontal boards to vertical battens, taking care where boards are jointed to ensure they sit securely on sufficient batten width. Fix vertical boards to horizontal battens, with vertical ‘counter’ battens to facilitate drainage and ventilation. Horizontal battens should have the top edge machined at an angle to help shed water into the cavity. 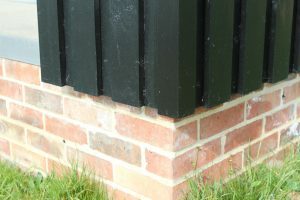 Support battens should be fixed at spacings of no more than 600mm, whether vertical or horizontal, and at no more than 400mm for diagonal boards. Use 400mm centres for high moisture content species, such as green oak. Create a well-ventilated cavity of at least 21mm. 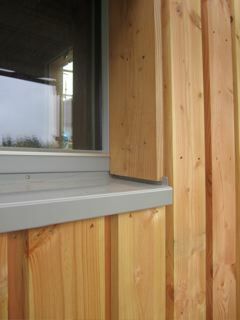 The more open the cladding style, the wider the cavity required to protect against moisture penetration. On timber frame buildings, the minimum sized batten (21mm) may be used so long as its position coincides with wall studs. 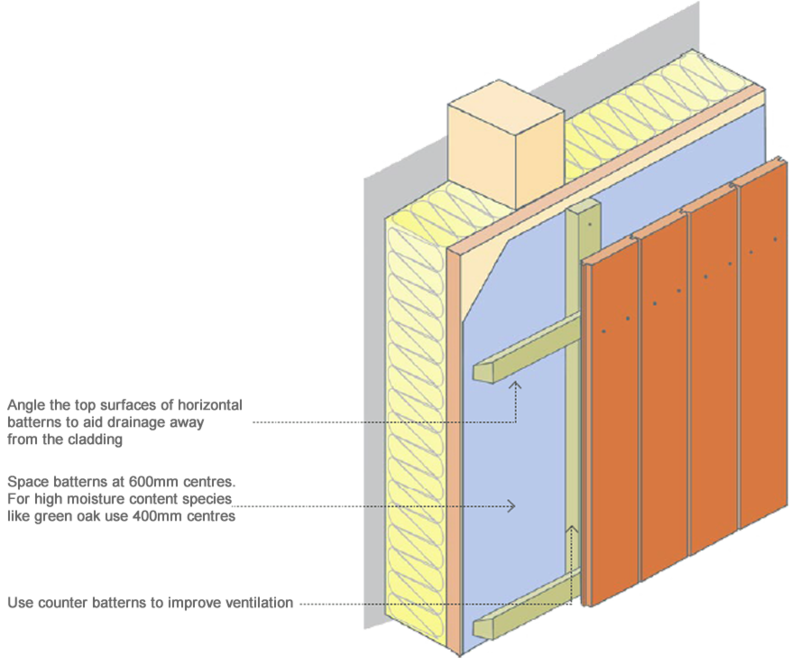 Timber frame buildings: The inner wall structure should be fitted with a breather membrane to seal the building against damp and weather penetration. The membrane should be durable and tear resistant in accordance with Type 1 membranes in BS4016. Masonry buildings: Fitting a breather membrane between cladding and battens attached to a property with cavity walls is not essential. Use a waterproof coating, membrane or wax-treated insulation board where cladding is fitted to an existing building with solid walls. 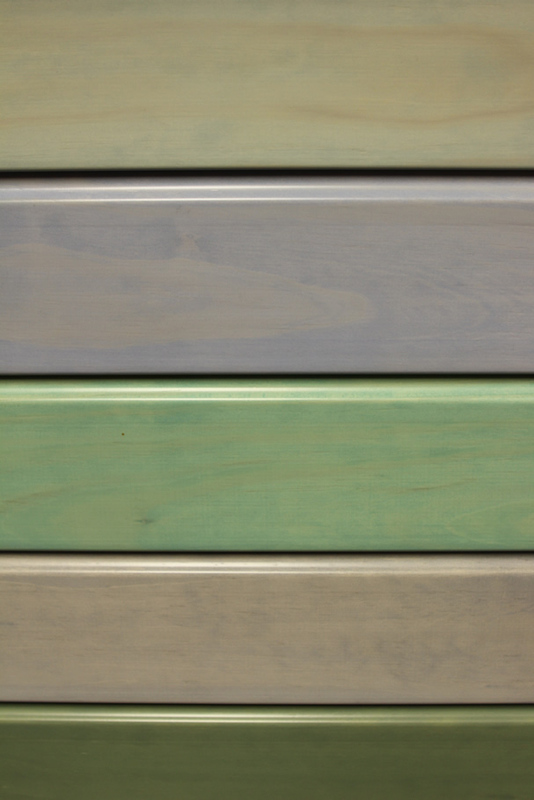 Some modified timbers, such as Accoya™, are acidic and require high quality stainless steel fixings. Use a specialist water-based micro-porous coating, opaque or semi-translucent. Coatings adhere better to sawn than planed boards. Re-coating before failure of the system means you don’t have to spend a lot of time preparing the surface. Pre-finished boards are widely available. See Cladding resources on Wood Campus. Generally, timber cladding is suitable for buildings of 18m or lower. No combustible materials are permitted for cladding on residential buildings over 18m high. Generally, this should be fire treated to Euroclass C-s3, d2. Amendments to the Building Regulations 2010, Approved Document Part B (Fire Safety) and 7 (Material and Workmanship), and further guidance can be accessed using the links below.